A new application example describes the steps used to design a microwave Wilkinson power divider using ideal transmission lines, microstrip implementation, physical design, and circuit compaction. The entire project is done in NI AWR Design Environment, specifically Microwave Office circuit design software, from schematic entry to physical printed circuit board (PCB) implementation, ACE™ automatic circuit extraction for evaluating the coupling between the microstrip sections, and AXIEM 3D planar electromagnetic (EM) simulator for final EM verification. 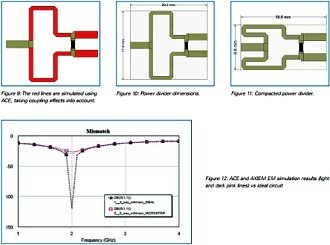 Download the application example, Designing a Reduced Footprint Microwave Wilkinson Power Divider with EM Verification.